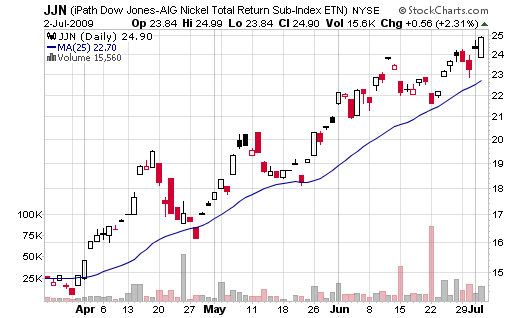 This month’s best performing ETF is iPath Dow Jones-AIG Nickel Total Return (symbol JJN), an ETN (Exchange Traded Notes) in fact. The nickel prices increased significantly during the last couple of months and this helped a lot of the stocks and ETFs exposed to the metal. Commodities prices in general were up during the last few months because investors became more optimistic that the world economy would recover and the demand for commodities would increase again. However, a return of the bear sentiment in the market will certainly take down the nickel and other commodities prices as well. You should have a clear exit strategy in place if you decide to buy this ETN. Is it still time to buy JJN today? Click here to find out.